On the other hand, if you walk in with what you know, people listen. They might even approve your budget. Katrina spoke on the importance of data science and why data scientists need to be marketers’ new best friends at Intelligent Content Conference (see that talk here) and Content Marketing World (see that talk here). This post summarizes her main points. All images come from her slides. 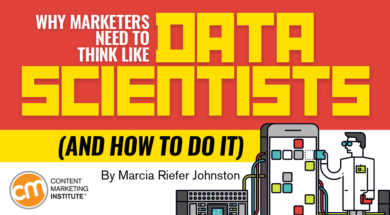 Why does data science matter in content marketing? Smarter business decisions come from better predictions. As a marketer, when you think like a data scientist, you make predictions that keep shareholders happier, you make customers happier, and you increase respect for your profession. Your content teams make better decisions, you build support for the content initiatives you propose, and your company gets more value from its content. When you work with (or work like) a data scientist, you build predictive models that enable you to say “I know” instead of “I think” – an important part of transforming marketing into a profit center. 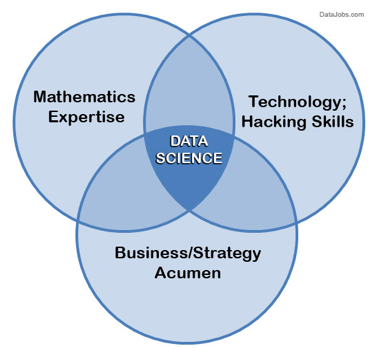 What is a data scientist, anyhow? What are marketers doing with these types of data today? Most marketers collect descriptive analytics. This data, gleaned from a tool like Google Analytics, gives a sense of what has happened – the historical results such as cost per link, click-through rates, and so on. Looking at this kind of data is a bit like looking in the rear-view mirror of your car. Few marketers use predictive analytics. This data enables people to predict the most likely outcome based on historical and real-time data. For example, using predictive lead scoring can give your hard-earned marketing-qualified leads (MQLs) the best start with your sales teams. 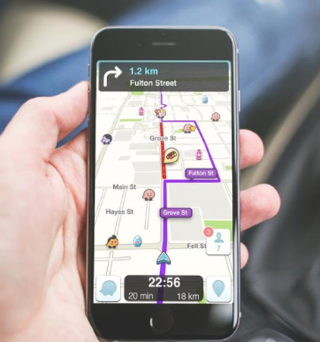 It’s a bit like using a navigation app that predicts your car’s arrival time, updating the prediction on the fly as circumstances change. Prescriptive analytics kick things up a notch, beyond where most marketers are today. This kind of analytics tells you not only what’s likely to happen but what you should do to capitalize on what’s likely to happen. It’s a bit like an autonomous driving car that not only predicts your arrival time but also drives you to your destination. Peek into that conversation between Watson and the marketer. While this kind of conversation may seem like science fiction, it’s becoming increasingly feasible. How can data scientists help you? Data scientists (or a data-science mindset) can help you plan your content, refine the content you create, and measure your results by building predictive models using a number of techniques and statistical models. Whether you’re working with a data scientist or cultivating your own inner data scientist, Katrina emphasizes the importance of testing. Scientists in any field start with a hypothesis and then test against it to see what they can learn. You might do A/B testing, serial testing, or whatever kind of testing gives you the feedback to determine what’s working and how well. For example, LinkedIn conducted A/B testing on sponsored content – native advertising in the feed – to determine which word performed better, “guide” or “e-book.” The post that used “guide” had a 95% higher click-through rate. In a similar test, “register” outperformed “join” by 165%. Think about your demand-generation funnel. If you can tweak the percentages at each stage of your funnel, you can have a huge impact on the number of leads you bring to the bottom. For an inspiring, informative, and relevant story, see this GrowthHackers post: The Growth Initiative That Cut Our Customer Acquisition Cost in Half. It gives insight into the way a data scientist might work with a marketing team, showing what’s possible when marketers commit to making business decisions based on what they know instead of what they think. To prove that the content you produce helps generate revenue, work with a data scientist to build an algorithmic multi-touch content-attribution model. This kind of model shows which content was read along the customer journey and which pieces of content, or combination of pieces of content, were the most effective for an audience. When you show up to a board meeting, take a marketing-sourced revenue goal, maybe 20% or 10% of the overall revenue goal. Then walk into future meetings and talk about pacing. How am I pacing against that revenue goal? How many marketing-qualified leads have I got? How many sales-qualified leads have I got? How many bookings have I got? And map that success into a multi-touch content-attribution model. That’s the kind of conversation we need to be accountable for to get a grown-up seat at the table. The vast majority of touchpoints (instances where potential customers interact with your brand) happen online. They occur when someone reads your blog post, e-book, or infographic, or watches your video. Marketing attribution models enable content marketers to more accurately understand how their content is influencing buyers, and to get full credit for their work. A data scientist could help build an algorithmic multi-touch attribution model specific to your organization. While at Cisco, for example, Katrina worked with a metrics dashboard based on insights gleaned from the Cisco data-scientist team through a Bayesian network analysis. The team used website data to predict which activities or pieces of content would result in a sales-qualified lead (SQL). Understand what numbers matter to your C-suite. Choose ways to measure your content performance. Hire a data scientist or explore a predictive-modeling SaaS platform. We all know that the language of business is the language of numbers. We know that executives’ hearts melt at those three little words: return on investment. Yet for many content marketers, it’s tough to bring data into the conversation in an effective way. For starters, Katrina suggests marketers get comfy with these terms: ROMI and CLTV. If you can hire a data scientist, do so. If you can’t, explore a SaaS platform that supports predictive modeling. These platforms act as a data scientist in a box – data science as a service. Learn to think more like a data science – or at least improve your content strategy – at Intelligent Content Conference March 20-22 in Las Vegas. Register today.